I think I have mentioned before that ham and mayo on a croissant was my favorite sandwich as a kid. And by favorite I mean that was one of the only sandwiches I would eat. I have grown up haven’t I? Well this is my favorite childhood sandwich on steroids, and it is AWESOME! I know you may look at the poppy seed sauce and wonder what that’s all about. Well the sauce bakes to the top of the croissant making an ordinary croissant extraordinary. It does not leave the croissants soggy. It actually gives them a nice caramelization and lots of added flavor. Since these make a good size batch and they can be assembled ahead of time they are perfect for a luncheon or shower. These may be my ultimate in comfort food sandwiches this winter, just throw in a bowl of soup and call it dinner. Note: These can be assembled and kept in the fridge up to 24 hours before baking. How handy is that?!? Spread each half of the croissant with a thin layer of mayonnaise. Place a piece of Swiss on the bottom half of the croissant. Evenly distribute the ham among the nine sandwiches. 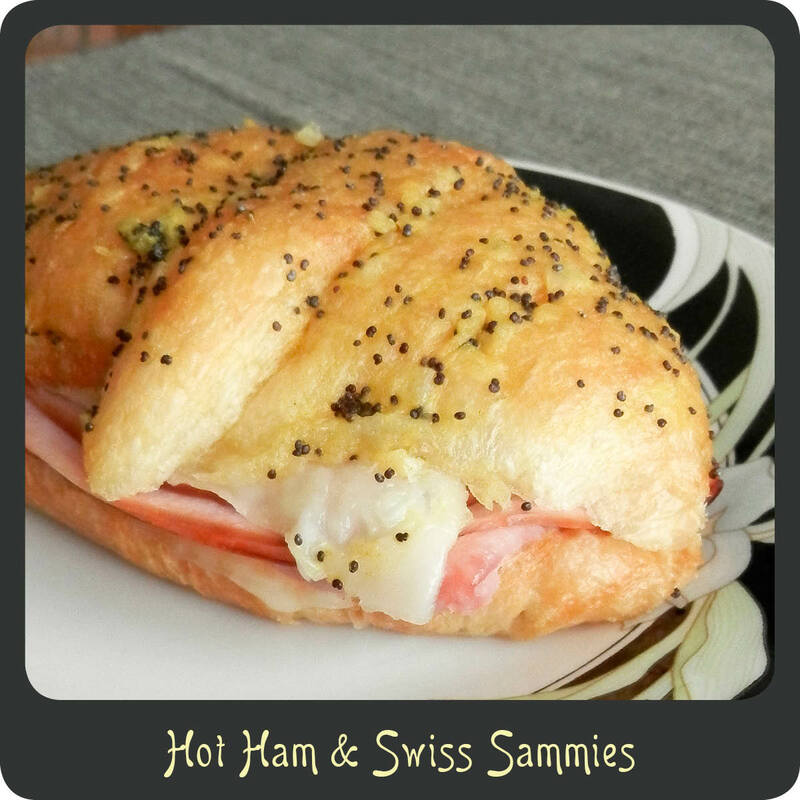 Top the ham with a second piece of Swiss cheese and then the croissant top. Place the finished sandwiches edge to edge in a large baking dish or on a cookie sheet. It’s okay if they are snug. In a small bowl whisk together all the poppy seed sauce ingredients. Spoon the sauce over the top of each sandwich and allow the sandwiches to sit for at least 10 minutes. Cover the baking dish with foil and bake for 15–18 minutes or until the cheese is melted. Remove the foil and allow the sandwiches to cook uncovered for an additional 5 minutes. I love these!! My Mom and Aunt make these for the holidays every year!! I will have to try them with the croissants-they usually use the mini dinner rolls and my Aunt uses honey mustard instead of plain mustard, and also uses shredded pizza cheese(mozzarella and cheddar)…but those are the only differences between your recipe and ours! Either way-they are super yummy and simple to make!